Not a great many things look like a pale lager, smell like coffee and taste a bit like chocolate. That would make this one of the few. 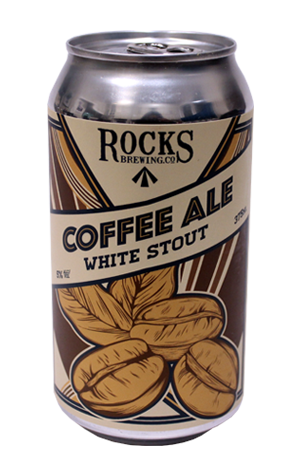 Channeling their inner Wonka, the crew at Rocks Brewing has turned out a Coffee Ale sub-categorised as a white stout. The basic premise of the “style” is to gamble on a consumer having being conditioned to relate to stout as a delicious black noun rather than an adjective representing strength, thus leaving the brewer free to present a strong pale beer with similar flavour characteristics to that most famous of dark beers while beginning to mess with your mind. Thing is, with Rocks’ one, it’s neither dark or strong – at just five percent ABV it’s fairly middle of the road in terms of robustness. But regardless of that, it takes little more than a smell and a sip to recognise this is a rather interesting beer. Stripping away the semantics, what you’re left with is something that starts with a striking coffee aroma that carries onto the palate and blends in with a nibble of chocolate and capsicum character. The body isn’t thick but it’s dense enough to carry everything it needs to, including a creamy sensation and a very light tinge of sweetness. Had they not bothered adding White Stout to the label it’s unlikely that’d be what would naturally spring to mind, yet reading those words does encourage your mind to start wandering down that track. And the more you think about it, the more it makes sense. Ultimately, though, the important thing is how it tastes – and it tastes like a brewery that’s having fun.